These are the terms and conditions that apply to all purchases of baby gift boxes by you from Rock-a-Bye-Baby Gift Boxes via our web site. We may well change these terms and conditions at any time without giving prior notice. Acceptance of order: By placing an order via the Rock-a-Bye-Baby website you are electronically agreeing acceptance of these terms and conditions. Order: You can purchase baby gifts from Rock-a-Bye-Baby Gift Boxes by completing the details required on the payment page and clicking the Confirm button, by giving us a call on 01702 469762 (9am to 2pm Monday to Friday) or by emailing us. All prices are displayed (and charged) in UK Sterling. We will accept your order providing the product is in stock. The order total reflects current pricing and your credit or debit card payment is approved by your credit card/debit card company. Your order represents an offer of contract from you only and is not binding until we have sent you E-mail confirming receipt and acceptance of your order. We are entitled to withdraw from any order in the case of errors or inaccuracies regarding the products appearing on our website. If certain products within the baby gift box are not available for any reason after we have accepted your order, we reserve the right to replace the missing item(s) with a similar product of equal or higher value. We will not notify you of this change. Payment: By selecting the "Confirm Order" button you accept that you are instructing us to charge to your credit or debit card the amount due to us as shown in your electronic order form in the "TOTAL". By confirming your order you agree that; you have sufficient funds on your card to complete the purchase, your address details are correct, the delivery address is correct and that the card you are using belongs to you. Barclaycard provide a secure link for your transaction details. As we are not responsible for the operation of this secure link we will not, unless we are negligent, be liable for any loss you may suffer if a third party obtains unauthorised access to any information you provide via this link. You acknowledge that it is not usually possible to detect from inspection of an internet transmission whether the original of it had been forged, wrongfully altered or otherwise misused or where the transmission details such as name of sender, sender's e-mail address, or date and time of transmission imprinted on it automatically are genuine, and you therefore agree to indemnify us against any actions, proceedings, damages, costs, claims, demands or losses whatsoever arising from your so acting, obeying or otherwise dealing in accordance with any such Internet transmission appearing to have been so furnished by you or on your behalf in the event that the said Internet transmission has been produced by forgery, wrongful alteration or other misuse of the original transmission or that said transmission details appear on it are not genuine. Delivery: Once you have paid for your baby gifts you are responsible for them. If we are unable to deliver the baby gift box to the address quoted at the time of the order (if address is incorrect) we will attempt to contact you and ask for an alternative delivery address. However we will charge you for re-delivery. If you wish to cancel your order and prefer not to have it re-delivered we will refund your card, minus the cost of shipping. Where shipping costs are included in the price of the box we will deduct the amount paid by us for shipping the item to you, this amount will vary depending on the weight of the baby gift box. If we do not hear from you within 30 days after attempting contact with you we will refund the card used to place the order minus the cost of shipping. 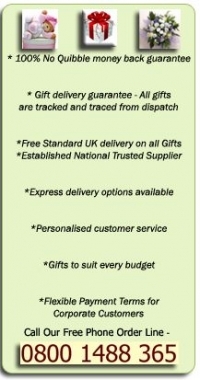 Please see our delivery options page for further details. All delivery dates specified on our website are estimates and terms of delivery shall not be made of the essence by notice. Our liability for non-delivery of the products shall be limited to replacing the product within reasonable time. If you change your address between the time of placing your order and the time of delivery you must inform us. Your order is shipped on the day of placing the order if placed by 2 pm or the following working day for orders received after 2 pm. If we are not notified of your change of address prior to shipping we will only re-deliver on payment of extra postage. Guarantee: If you wish to cancel an order or return the products for a full refund, please contact us by email, or by phone on 01702 469762 (9am-2pm Monday to Friday) or by post to The Kiddie Company (UK) Ltd, 65 Tickfield Avenue, Southend on Sea, Essex, SS2 6LL. If any baby gift box delivered is faulty or damaged then it will be replaced by either the same type of baby gift box or one of similar value if the originally ordered baby gift box is no longer available or a full refund will be given as long as the baby gift box is returned in its original packaging within 30 days of purchase. If you are not happy with your choice of baby gift box then a full refund will be given provided it is returned in the same condition and, to the extent possible, in the same packaging as when we delivered it to you, within 30 days from the date of delivery. You are always required to obtain proof of postage when returning items to us. You are liable for the return posting costs. Liabilities: We do not make any guarantees that our website is secure or is free from infection by viruses or anything else that has contaminated or disruptive properties. We reserve the right to change information, prices and descriptions of listed goods at any time. Occasionally certain products may vary in style and material to that shown on the website. We do our best to correct errors and omissions as quickly as possible after being notified of them. We do not accept any liability for any losses or claims arising from any liability to access our website or any failure to complete a transaction. We will not be liable for any indirect or consequential loss (whether for loss of profits, loss of business, depletion of goodwill or otherwise) or damage of any kind arising out of the use of the website or use of the products supplied in the gift boxes. If we are unable to complete an order due to stock depletion we will contact you to discuss your options. Warranties: All the products contained in our baby gift boxes comply with the health and safety laws of the United Kingdom. We therefore cannot guarantee that these products comply with the health and safety laws in your own country. We will not have any further liability in respect of the products. Site Content: This website is for your own personal use. It is protected by copyright. The images contained in this website have been reproduced with the express permission of the owner(s). You may not modify, copy, distribute, display, perform, reproduce, publish, licence, create derivate works from, transfer or sell any information obtained from this website. External Links: We cannot accept responsibility for the content of any other websites to which our website has links and shall not be held responsible or liable for any loss or damages caused or alleged to have been caused by the use of or reliance on any content, goods or services available on such hyperlinked sites. Our acceptance of links to other websites does not mean we endorse the material contained in those websites. Complaints: If you have any complaints or comments about our web site or any of the baby gift boxes or contents supplied to you, please contact us by email, or by phone on 01702 469762 (9am-2pm Monday to Friday) or by post at The Kiddie Comapany (UK) Ltd, 65 Tickfield Avenue, Southend on Sea, Essex SS2 6LL. General: These terms and conditions do not affect your statutory rights. Baby Gift Box Content: Occasionally we are unable to obtain certain items to place in the gift box. When this occurs we reserve the right to replace an item advertised with another item of equal or higher value. We are unable to advise you when this occurs.